Lieutenant Richard Guérin, the protagonist of Antonin Varenne’s Bed of Nails had a theory of interconnectedness that revolved around a red thread tied around the ankles of people who were linked in some way. It’s not until around three-quarters of the way through Kari Hotakainen’s beautiful novel, The Human Part, that we discover that this novel deals with exactly the same theory, and the meaning of that fantastic cover becomes apparent: this time the thread is replaced by red yarn (the old woman at the heart of this story and her husband were once the proud owners of a yarn shop), but the theory remains the same. I have since learned that the red thread linking these two extraordinary MacLehose Press books has a name: the Red String of Fate. My name is Salme Sinikka Malmikunnas, and everything that I say will be printed word for word in this book. So opens Kari Hotakainen’s tenth novel, with a meeting between an elderly woman and an author who has run out of ideas. The author is paying good money, and Salme sees an opportunity to help her family – they have recently suffered a catastrophic event, and Salme’s husband has not spoken since. There is friction immediately – the author is keen to take the bones and add enough fiction to flesh it out and make it sellable; Salme has a deep-seated distrust of, and dislike for, fiction and gives the author “a little bit of a tongue-lashing over this”. Her story is one of ideals, omitting the details she wishes to omit, and paints a picture of her three grown children that has them happy, healthy and holding down stable and well-paid jobs. The reality, if that is actually what we’re presented in the other sections of the book, turns out to be much different. The Human Part is structured so that we see things from the points of view of all of the key players. Salme tells her story in a number of sittings, and these are related in the first person, as if they might have been transcribed directly from the Dictaphone used to capture the story. We then meet the grown children, and discover that their fates are much different to what we have learned from their mother. What is, perhaps, most interesting about the book, is that we’re never quite sure why this discrepancy exists: is Salme outright lying, rather than just omitting some details, as she would lead us to believe? Are the children lying to their mother, so that the ideal life she describes for each is the life she believes they lead? Are the sections describing the children pure fiction, invented by the author to make this old lady’s story seem more interesting and entertaining. There are subtle clues throughout, but Hotakainen leaves it to the reader to decide. Either way, Salme’s dislike of fiction would seem well-founded. At the heart of the story lies the catastrophic event that has prompted Salme’s need for money. When the event happens – it is described around three-quarters of the way into the book – a light goes on inside the reader’s mind, and all of the seemingly chance encounters between characters suddenly take on a whole new meaning. The closest I can come to describe it is that feeling most people get when they reach the end of The Sixth Sense – that moment of revelation that leaves you open-mouthed in astonishment and wondering how you might have missed what now seems so obvious. 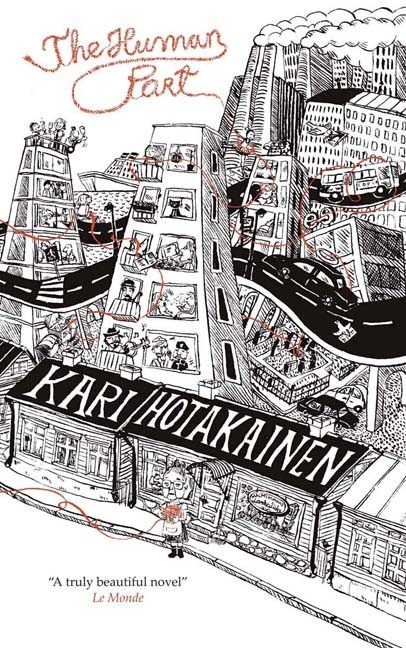 In this case, the clue is embedded in the cover – that red yarn that connects everyone and everything together – but it’s still extremely clever how Hotakainen manages to make all the pieces fit so neatly together. Outright hilarious in the early stages – the character of Salme is wonderfully-wrought, and the postcards she sends to her children are at once cringeworthy and beautiful (“I could see from your expression last time that my boy hasn’t been having luck in the world of women. Listen to your mother:…If she eats greedily, uninhibitedly, she will be frisky and warm in bed too.”) – and with a satirical, tongue-in-cheek view of modern Finland, the novel ultimately descends into darkness and violence as the family pulls together to find a way through their terrible time. It’s a testament to the author’s skill that it never loses its charm and the characters never lose the sympathy or empathy of the reader. This seems an unusual one for me, and I’m not afraid to admit that the beautiful cover was what enticed me to check what was inside. The Human Part is not at all what it seems and, at its core, is exactly what I usually look for: a book that examines the darkness at the heart of the human condition. It’s beautifully-written, in an excellent translation that manages to lose none of the subtleties that give the story its sense of ambiguity – a sense that should give every reader a slightly different experience. A beautiful package that won’t disappoint on any level, it will leave the reader – as it has me – pining for translations of Hotakainen’s back catalogue as soon as possible. This sounds like a fascinating and brilliant novel, and I really enjoyed reading your review. Thanks.